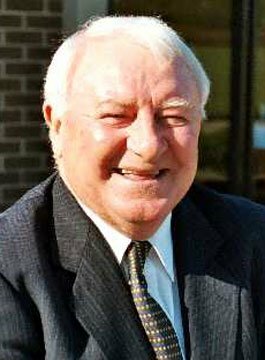 Tommy Docherty is a Former Manchester United Manager and Scottish Football International. Docherty is one of the most colourful characters in football – the man who often claims to have had more clubs than Jack Nicklaus! The fast-talking, wisecracking Glaswegian is a stalwart of the After-Dinner circuit, known throughout the country as ‘THE DOC’. Tommy Docherty’s football career began when he joined non-League Shettleston Juniors. In 1946, he was called up for National Service in the Highland Light Infantry. While completing his National Service, Tommy represented the British Army at football. On demobilisation, Docherty was offered a contract with Celtic F.C. in 1947. After spending just over two years with the Celtic, he joined Preston North End. It was at Preston where he enjoyed the most successful period of his playing career, making over 300 League appearances, and appearing in the 1954 FA Cup Final. Whilst at Preston, Tommy made the first of his 25 appearances for the Scotland international squad. In 1958, he joined Arsenal, and stayed with the club until his retirement in 1961. Tommy was immediately offered the position of player-coach at Chelsea F.C. and within twelve months he took over as manager. During his first year in charge he replaced many of the club’s older players in favour of emerging youngsters such as Terry Venables, Peter Bonetti and Barry Bridges. The team achieved promotion back to Division One at the first attempt and finished 5th the following year. He led Chelsea to the FA and Fairs Cup semi-finals, before reaching the FA Cup Final in 1967. In 1971 he was appointed manager of Scotland. Manchester United poached Docherty in December 1972. He quit his job with Scotland and stayed with United for 5 years. He later managed Derby County, Queens Park Rangers, Sydney Olympic, Preston North End, South Melbourne, Wolverhampton Wanderers and finally Altrincham F.C. from 1987 to 1988 before retiring from football. Tommy Docherty is recognised as one of the UK’s funniest football after dinner speakers.